This is an intriguing novel, set in a place I know little about. I enjoyed the insight into both the political and personal aspects of Hong-Kong during and post WWII. 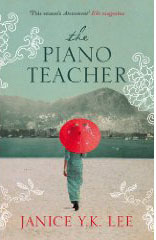 The story switches between 1943 and 1953 and follows the two lovers of Englishman, Will Truesdale: One a Eurasian socialite and the other the English piano teacher for the well-to-do Chen family. The differences between these women are great but by the end we feel that all characters are guilty of a kind of betrayal. As Victor Chen says, “in times of war, many decisions are made, and things are done without the benefit of reflection.” Many secrets are held and revealed and what is acceptable in one family could be devastating to another.